for Chrome OS and Windows -- a simpler, faster way to use Hangouts on your computer alongside whatever else you’re doing. Keep the conversation going, without taking over your desktop. The app has a streamlined design that keeps your chats accessible without getting in the way of everything else. Your contact list and all your chats are condensed into one easy to toggle window. Also, you’ll get integrated notifications that alert you to new messages, so you can quickly find the conversation you’re looking for. More app, less Chrome. It works outside of your browser so your chats are always available, not tucked away inside a window. You’ll get all your messages as long as you have the app running, and your chats will sync across Hangouts on all your devices. Voice calling from your desktop. The app now has all the video and voice features you’re used to in Hangouts. We recently announced you can make phone calls to any number in the world (via Hangouts dialer) and now you can do this right from your desktop. If you use Google Voice, the app includes complete Google Voice support, so you can make and receive calls, and get your voicemails and SMS messages directly in Hangouts. Download the Hangouts Chrome App today and get started with a new experience tailor-made for your desktop. If you’re already using the Hangouts Chrome extension on your ChromeOS or Windows computer, you’ll also see a promo to try the new app over the next few weeks. To learn more, visit the Hangouts Help Center. When you’re chatting with your friends and family, you want your conversations easily accessible, not buried in browser windows. 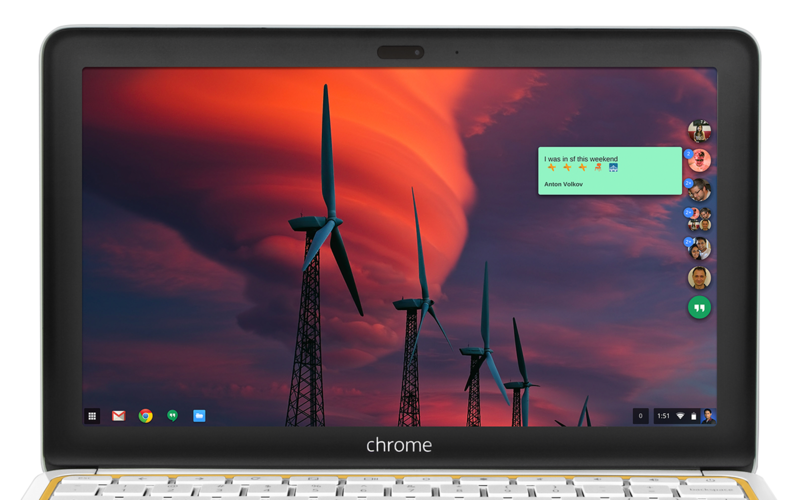 Today, we’re introducing the Hangouts Chrome App for Chrome OS and Windows -- a simpler, faster way to use Hangouts on your computer alongside whatever else you’re doing.